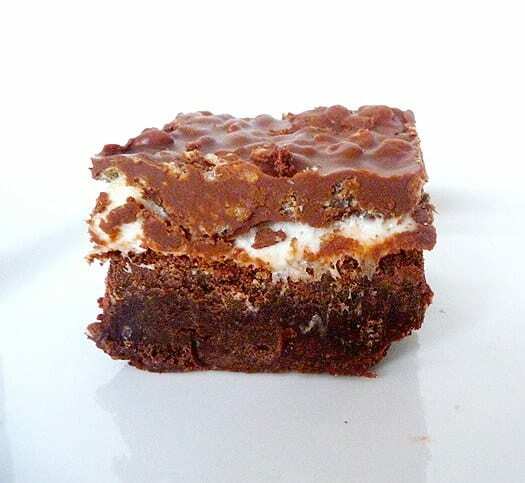 Marshmallow Crunch Brownie Bars | happy.harvey.home. My team at work got together the other night for a good ole southern summer back porch BBQ. Complete with BBQ on the green egg, homemade mac n cheese and all the fixings. One of the favorite desserts of the night were these crunch bars- the perfect combination of chocolate, peanut butter and a little crunch. Great for kids as well because they don’t fall apart in your hands. Enjoy! 1. Preheat the oven to 350 degrees F. Grease a 9×13-inch pan. 2. For the brownies: In a medium saucepan, melt the unsweetened chocolate, butter and ¾ cup of the semisweet chocolate chips over medium heat. Stir occasionally while melting. Set aside and cool for 5 minutes. 3. In a medium bowl sift the flour, baking powder and salt. Set aside. In a large bowl , whisk the eggs thoroughly. Add the sugar and vanilla and whisk until well blended. Stir the melted ingredients into the egg mixture, mixing well. Stir in the dry sifted ingredients and mix well. Fold in the remaining ½ cup semisweet chocolate chips. 4. Pour the batter into the prepared pan, smoothing the surface with a spatula. Bake for 25 to 30 minutes, or until a cake tester inserted into the corner of of the pan comes out with moist crumbs. 5. Remove the brownies from the oven and immediately sprinkle the marshmallows over them. Return the pan to the oven for 3 more minutes. 6. Meanwhile, place the milk chocolate chips, peanut butter, and tablespoon of butter in a medium saucepan. Melt over low heat, stirring constantly, until completely melted. Remove from heat, add the Rice Krispies and mix well. Allow to cool for 3 minutes. 7. Spread the mixture evenly over the marshmallow layer. Refrigerate until chilled before cutting. This entry was posted in Desserts, Recipes by annettelharvey. Bookmark the permalink.